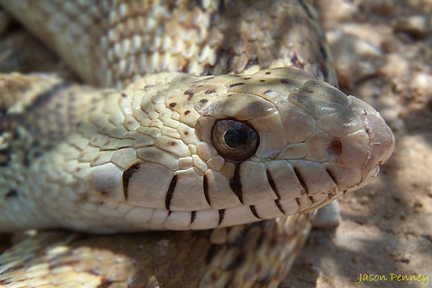 This site is meant to be a reference point for snake identification in Hudspeth County, Texas and other parts of Texas as well. All of the species contained on this site occur in other parts of the state but the majority of the photos contained here are mainly from the Hudspeth County Area. Click on any of the links above to view the snakes photos with accompanying information. All feedback is welcomed. Hudspeth County is Located between El Paso County and Culberson County, Texas. The county seat is Sierra Blanca (Click for Map) which is about 80 miles East of El Paso, Texas via I-10. The Southern end of Hudspeth county is the U.S. / Mexican Border. The Northern side of the county is the New Mexico / Texas state line. Hudspeth County is somewhat unknown to field observers as allot of its good habitat is remote and/or on private land. There are however, many miles of public paved and dirt roads on which to observe snakes. Another possible reason for its lack of notoriety is its close proximity to more popular locations such as Jeff Davis Co., Presidio Co., Brewster Co., Ect. I do not practice snake "collecting". I enjoy seeing them in their native habitat, photographing them and leaving them for future generations to enjoy. � 1997-2002 Jason Penney - ALL photo's and text on this site are copyrighted work by Jason Penney and cannot be used without my permission.